Here you will find information about holiday homes on La Palma, other activities, flights, rental cars, background information and much more. For very detailed information about La Palma we refer you to our special La Palma site: La Palma Plaza . This now-popular info site gives you answers to (almost) all the questions you have about La Palma. Nice houses in Tazacorte from La Palma vacation . The coast of La Palma is full of dolphins. Depending on the season – a little more in winter than in summer – you will find large schools here with dolphins and regularly also whales. During these boat trips you can also encounter other animals such as turtles and hammerhead sharks. 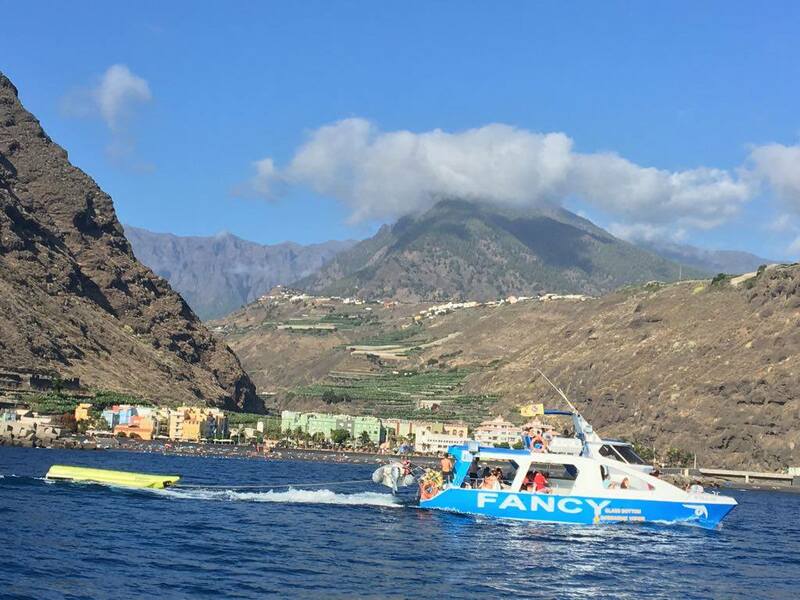 On La Palma these boat trips are provided by two companies, both from the Port of Tazacorte, on the west side of La Palma. With this boat the chance of spotting dolphins is greatest because it has a sonar to look for these special animals. The boat is quite large, it is a catamaran and is therefore stable in the water. The Fancy II also has a glass bottom. If the boat is stationary, take a look. Perhaps you are lucky and see a dolphin flash by at that very moment. The Fancy II is a real tourist boat, usually quite full and with a banana on which you are dragged by a zodiac in front of the beach of Puerto Naos. The Fancy II is the most advisable for children. The chance to see dolphins is around 80%, of course you have to be a bit lucky. You can discuss the boat when you are here on vacation. Go to the port of Tazacorte and there is someone at a stand where you can buy tickets. Or call: (+34) 609 531 376. People speak German. Experience shows that just calling is more convenient than sending an email. The Fantasy is also a boat with a glass bottom. This takes a maximum of 12 people. They are also looking for dolphin whales. and of course there is a chance to see other marine animals such as turtles and hammerhead sharks. The nice thing about this boat is that you can see the bottom very well. The glass bottom of this boat is 2 by 3, so really big. Safari route: 4 hours, including lunch and drinks, € 45 for adults, € 25 for children. North route: 2 hours, including tapas and drinks, € 50 for adults and € 40 for children. 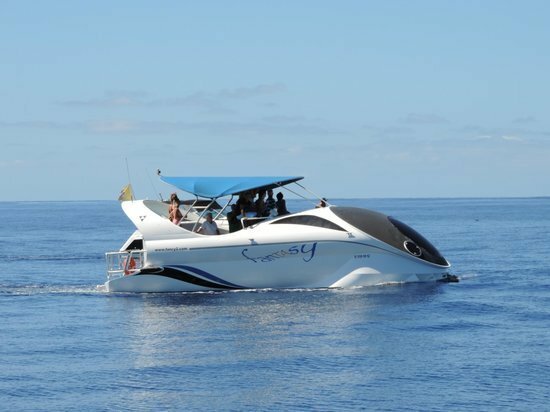 If you book with us, Casa de Buceo – La Palma diving house , 2 dives, or a dive for 2 people, or a snorkel tour, you get 10% discount pp on your tickets for the Fancy II or the Fantasy . Ask us for the conditions. The Bussard is an old crab fisherman , an attractive wooden barge with a nice deck to get a breath of fresh air and to sunbathe. There are a maximum of 12 people on the Bussard so that it is never packed and you have enough space everywhere. This boat focuses more on a boat trip with good food. Everything is perfectly prepared, cup of coffee, soda, wine and tasty food (chicken, salads, potatoes, sauces). In short, enjoy the water. Just like the Fancy, the boat sails along the coast in search of dolphins. These have to be spotted with the naked eye and therefore you have to be a little bit more lucky. But the chance that you see them is certainly 75%. In terms of atmosphere, the Bussard is much nicer and more relaxed. Maybe a little more unstable in the water, but if there are no waves you will not be bothered by the swell anyway. Really a nice boat trip! With the inia you go “full-speed” on the sea. 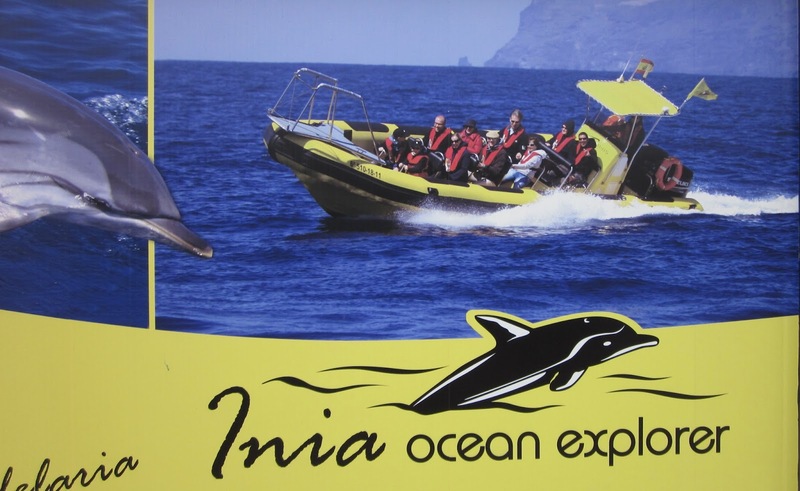 You will sail on a large zodiac (an inflatable speed boat) in search of whales and dolphins. The Inia has room for 10 people. The chance that you will see dolphins and / or whales here is very high. Compared to the other boats, much more primitive (no toilet and food / drink), but spectacular. For great food and drinks on La Palma, click here ! With Ryan-air to Tenerife south or Gran Canaria, then continue with the boat , or fly with Bintercanarias or CanaryFly .